As part of the new Low Voltage Directive (2014/35/EU), manufacturers are required to include an ‘adequate analysis and assessment of the risk(s)’ for their equipment within the technical files. What this really means is that a Risk Assessment should be undertaken as part of the conformity process. Product Risk Assessments have been around for a number of years now with the Machinery, ATEX, and Medical Devices Directive all having them as a requirement, but will now become a common requirement across all of the new 2016 CE Marking Directives. 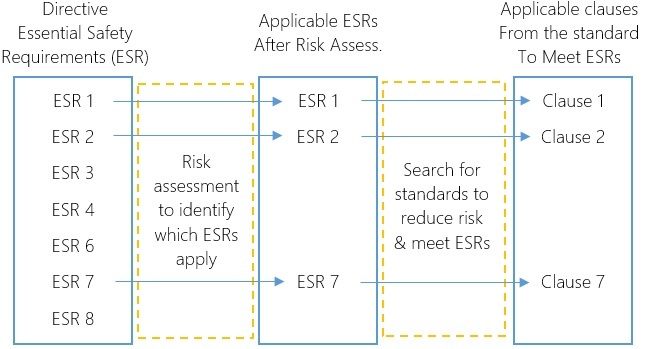 The purpose of the risk assessment is to help manufacturers identify the hazards relevant to their products and to use this information to help identify the applicable essential requirements of the Directive and any standards that can be employed to reduce or eliminate the risks (as illustrated in the diagram below). Whilst risk assessments can be subjective, there is guidance available to help manufacturers through the process. CENELEC is European Committee for Electrotechnical Standardisation and they have released a guide that provides key information for what these risk assessments for electrical safety should entail. It gives details of the risk assessment process, as well as examples of potential hazards associated with electrical and electronic equipment and even guidance on the scoring system too. The CE Marking Association have worked on producing a template for Low Voltage Risk Assessments, translating the information found in the guide into an easy to understand format. A downloadable version of this spreadsheet is available to members on the Low Voltage page within our member’s area. We believe that the template will be straightforward to complete, but if you have any questions please feel free to get in touch with our team at 01564 792349.